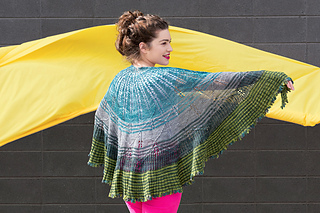 This three-quarter circle shawl is worked from the middle, out to the ribbed border. 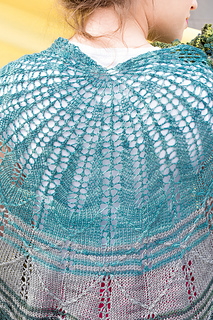 The first half of the shawl is worked in three shades of blue, in a lace pattern, increasing every 6th row. Then the first shade of green is joined and the stitch count is doubled, whereupon the three shades of green are worked in a striped pattern, forming a ribbed ruffle. Finally, the variegated colorway is joined to work the last row of the ruffle and the picot bind-off. The picot bind-off is a long slog, but produces a flexible edge and decorative accent that ties all the colors together. If substituting with a different bind-off, ensure it is loose enough not to constrict the edge of the ruffle. 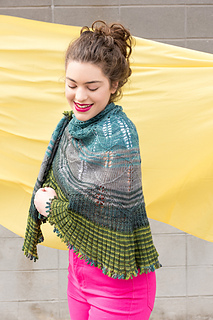 There is ample yardage in this set to work the entire shawl, with a little of each color left over. 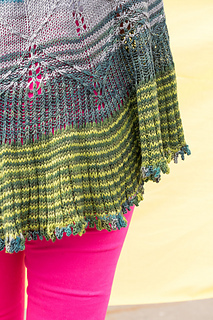 If desired, the Border could be worked until all green skeins are exhausted, before working the bind-off. 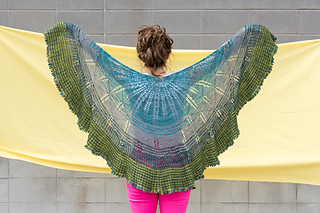 If you have less yardage than indicated, 6, instead of 9 repeats of the Main Chart will produce a half-circle instead of a three-quarter circle shawl and use approximately two-thirds of the yardage needed for the three-quarter version. The Set-up Chart would need to be modified to account for the change. Stitch pattern provided in chart form, only.